This site has been designed to be a bridge between Henry Nash Smith's cultural study, The Virgin Land: The American West as Symbol and Myth , and James Fenimore Cooper's novel, The Pioneers . Smith uses Nathaniel Bumppo, aka. 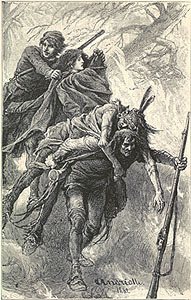 the Leather-stocking, a central character in The Pioneers , as an example of a frontiersman in conflict with the spread of civilization in the America of the late 18th century. Readers of The Virgin Land who wish to further explore the character of the Leather-stocking may find this site useful as an access point to The Pioneers , the novel in which he first appears. This site may also be found useful by readers of The Pioneers both as a study guide and as a link to the archetypical treatment Smith gives to the Leather-stocking. A synoptic text of Henry Nash Smith's The Virgin Land may be found at the University of Virginia's American Studies Hypertext project. Soon, an electronic text version of The Pioneers will be available at the University of Virginia's Electronic Text Center. Contained in this site are a cast of characters in The Pioneers with brief descriptions and an outline of the events of The Pioneers organized by chapter. These may be used by readers of the text as a reference, and they may also be used by readers of The Virgin Land to pinpoint events mentioned in that text. Also contained in this site are short explications of three central events of The Pioneers in which Cooper clearly shows the Leather-stocking's attitudes towards the civilization of the West. These events include the Deer Ambush from chapter 1, the hunt of the deer swimming in Otsego Lake from chapters 26 27, and the Leather-stocking's lament at the Grave of Chingachgook from chapter 41. The above image is from the frontspiece of The Pioneers published in 1900 by A.L. Burt Company. It shows the escape from the burning mountain as described in chapter 38. Click here to see a non-frames version of the Cooper/Henry Nash Smith project.